The United States entered World War I on April 6, 1917; three years after the conflict had begun. Although the U.S. was involved in the war for just 18 months, the home-front effort was widespread. 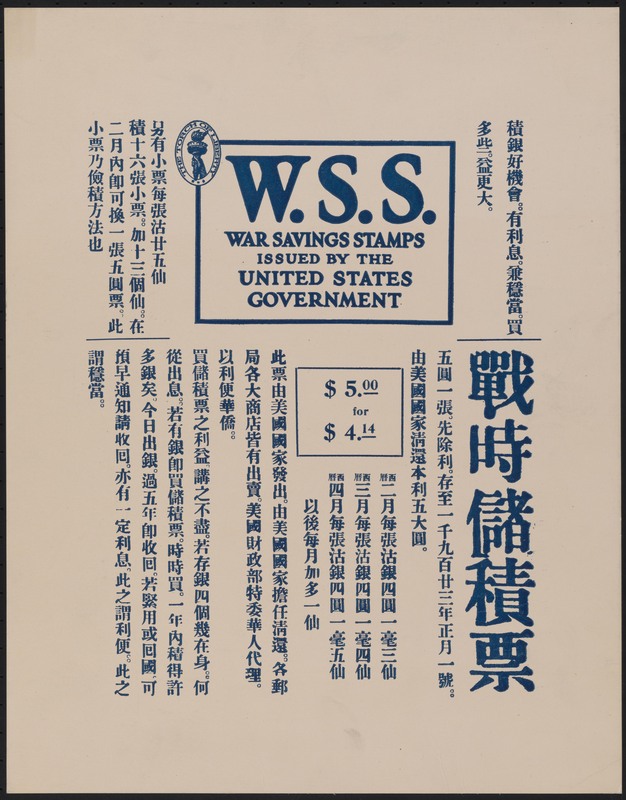 Those who did not join the fight overseas joined the effort at home by rationing food and materials, buying war savings bonds, and volunteering their time and money. Many of these activities are documented in our collection, as described in an earlier blog post on our World War I and World War II collection. New Yorkers were reminded of these efforts on a daily basis by a barrage of propaganda posters around the city. 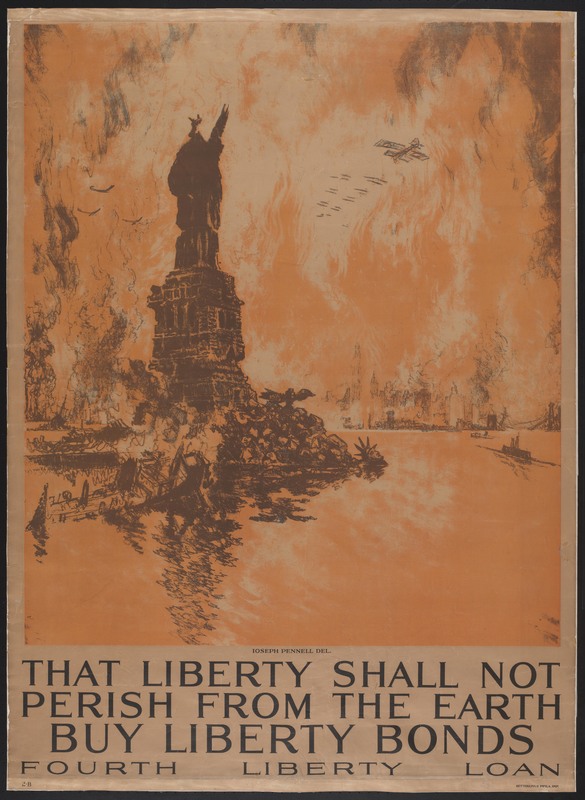 The Museum’s newest exhibition, Posters and Patriotism: Selling WWI in New York, examines these posters and other mass-produced images intended to stir the American public to wartime loyalty, duty, and sacrifice. 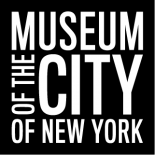 New York City, the nation’s art and advertising center, was the home of the country’s visual propaganda efforts during the war. The Division of Pictorial Publicity (DPP), formed by the federal government’s wartime Committee on Public Information at the start of the war, oversaw the work of more than 300 painters, designers, and illustrators who volunteered to create posters, bus and store window cards, advertisements, cartoons, buttons, and banners. The division was headed by artist Charles Dana Gibson, then president of New York’s Society of Illustrators, who recruited friends and fellow artists James Montgomery Flagg, Joseph Pennell, N.C. Wyeth, and Ellsworth Young. These artists crafted powerful messages meant to trigger an array of emotions, from love of country to fear, anger, or hatred. 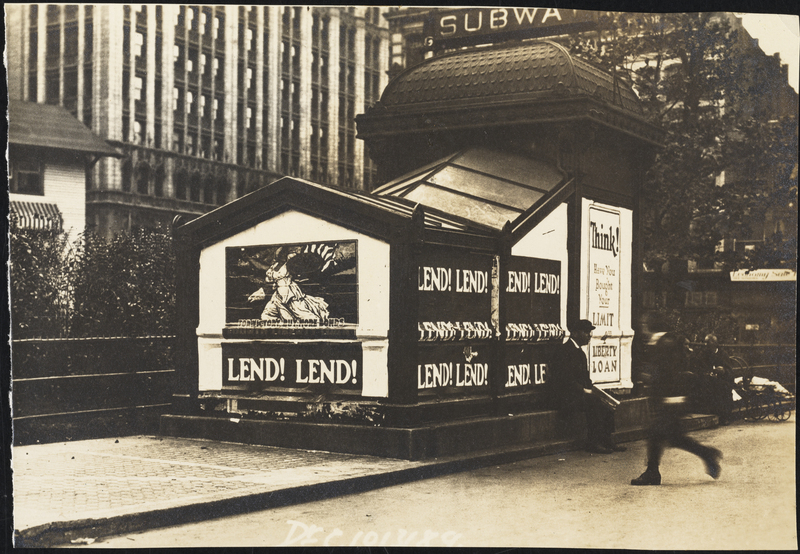 Nearly 20 million copies of some 2,500 posters flooded the country to encourage support for a war that many Americans criticized or opposed, especially in the diverse city of New York. European immigration to New York City peaked in the early 20th century, making it the most multi-ethnic city when the war began. Confrontations between the various ethnic groups were not uncommon, and President Wilson recognized this when weighing whether or not to enter the war, saying “our mixed populations would wage war on each other.” An overarching theme of wartime propaganda was unity, with an undertone of loyalty. 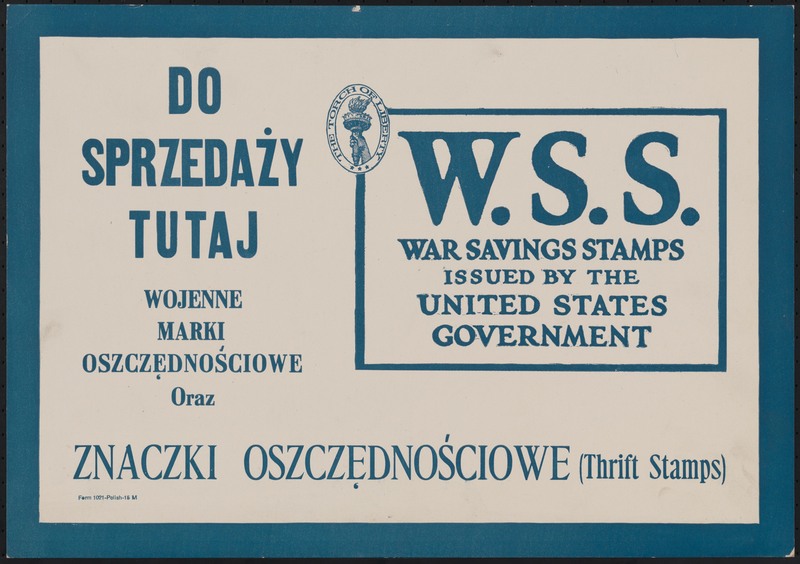 Posters advertised the sale of War Savings Stamps in several different languages, including Italian, Polish, Japanese, and Yiddish. 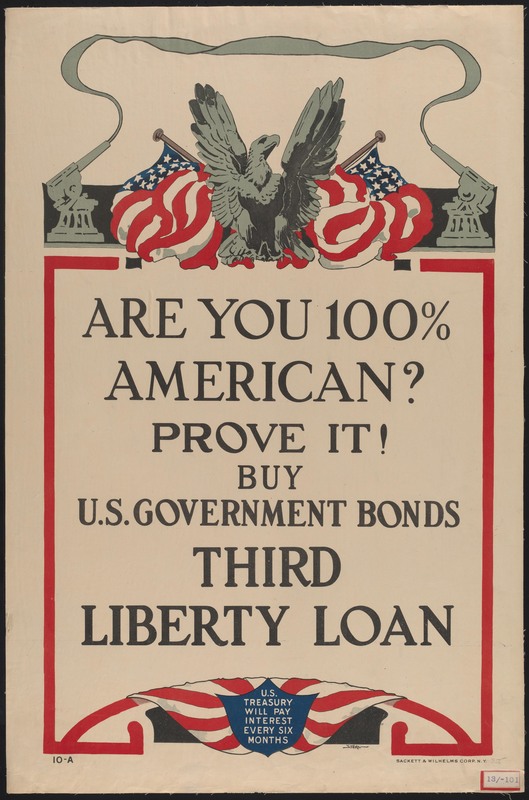 At the same time, posters demanded that all New Yorkers prove they were “100% American” by fully backing the Allies and disavowing any lingering loyalty to Germany or Austria-Hungary. 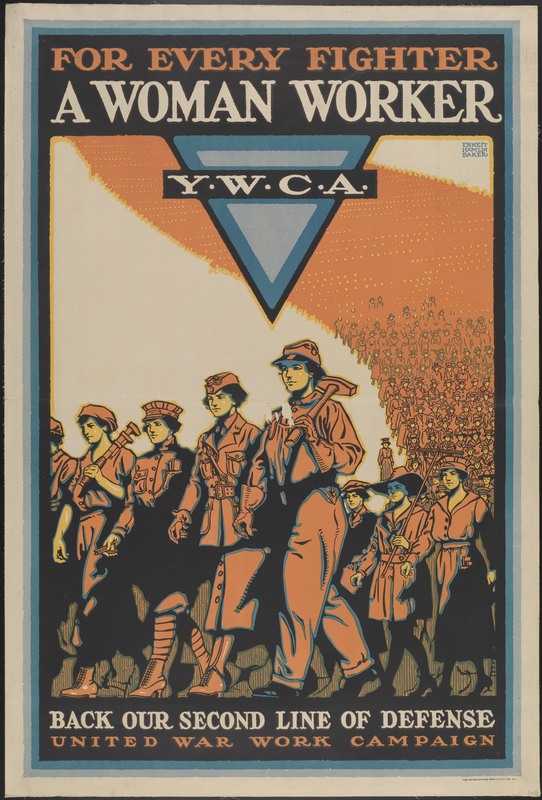 The United War Work Campaign coordinated wartime fundraising for seven independent welfare societies: the Young Men’s Christian Association and the Young Women’s Christian Association, National Catholic War Council (Knights of Columbus), the Jewish Welfare Board, War Camp Community Service, American Library Association, and the Salvation Army. Each organization published posters appealing to its target audience to contribute to the common cause. Women were essential to the home front – they filled jobs left by soldiers, volunteered for services like the Motor Corps of America, and led the rationing effort at home. 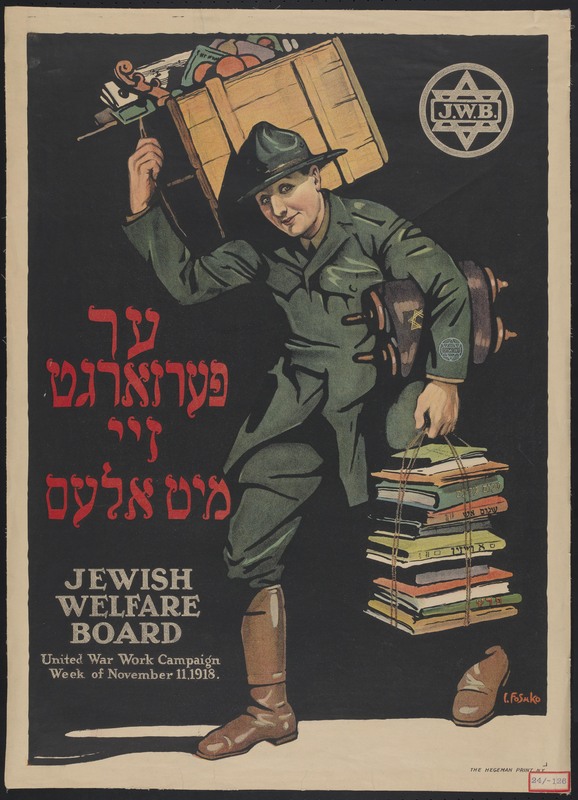 A selection of the posters was shown in a special exhibition that year, Posters of the Allies – World War I, but had not seen the spotlight again until the opening of the current exhibition. This entry was posted on April 4, 2017 by Emily Chapin in Exhibitions, Manuscripts and Ephemera and tagged Charles Dana Gibson, Collections, diversity, Division of Pictorial Publicity, exhibitions, James Montgomery Flagg, Jewish Welfare Board, John W. Campbell, Joseph Pennell, Liberty Loan Committee, Propaganda, United War Work Campaign, women, World War I, Young Women's Christian Association.